The district will host large crowds for Inauguration Day 2017 and getting around the region throughout the three-day weekend will be challenging. Security and transportation plans for the 2017 inauguration weekend were developed through a partnership of local, state, and federal law enforcement and public-safety agencies. Parking in the city is limited, so public transportation offers the best way to get to inaugural events. Viewing the inaugural ceremonies from the National Mall does not require tickets. However, backpacks, bags, and purses will be checked. The non-ticketed area of the National Mall begins at 4th Street NW and extends past the Washington Monument to 17th Street NW. Bring your patience and be prepared to wait in long lines. 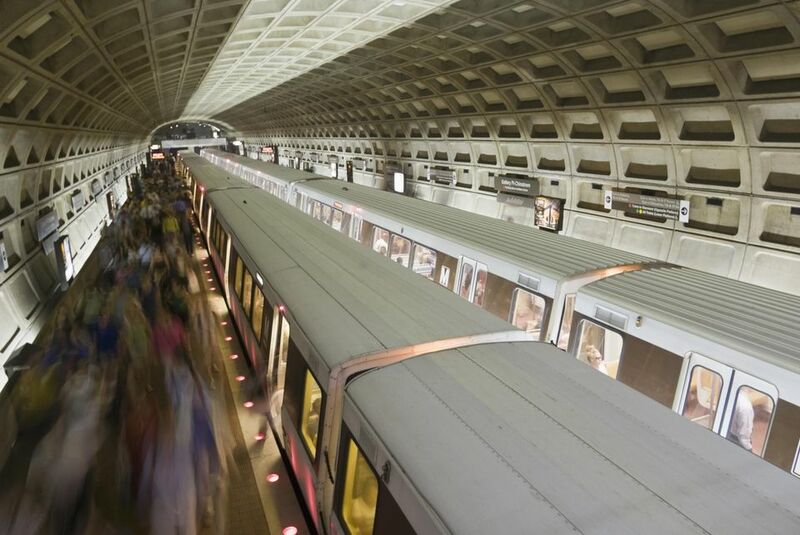 Familiarize yourself with the Metrorail system before you head for the city. You should purchase your Metro fare in advance to save time, and be sure to add enough value to your SmarTrip card to make a round trip. Metrorail will open at 4 a.m. and close at midnight on January 20, 2017. Due to security measures, Archives, Mt. Vernon Square, Federal Triangle, and the Smithsonian stations will be closed all day. On January 21, Metrorail will be open from 5 a.m. until midnight and will run extra trains to accommodate the expected crowds. Peak fares will be in effect on Inauguration Day until 9 p.m. Normal parking rates will apply. Metro will offer online orders for its commemorative inaugural SmarTrip cards, which come pre-loaded with a one-day pass that provides unlimited travel on Metrorail on January 20. The cards will be available to purchase at most CVS stores around the region. Viewing the Inauguration Day ceremonies from the U.S. Capitol grounds requires a ticket. Recommended Metro exits for individuals with tickets include Capitol South, Eastern Market, Union Station, NoMa-Gallaudet U (New York Avenue), Judiciary Square, Gallery Place-Chinatown, Federal Center SW, and L’Enfant Plaza. Metrobus will operate on a weekday rush-hour service in the morning, followed by an early rush hour in the afternoon. With the anticipated street closures around the National Mall and Pennsylvania Avenue for the parade, all Metrobuses will be prepared for detours. Bus customers should plan significant extra time to travel through those areas. No vehicles, including buses, will be allowed to pass close to the U.S. Capitol, nor will they be able to cross Pennsylvania Avenue. MARC Train will run a limited Penn and Brunswick Line morning and afternoon schedule on Inauguration Day, and advance tickets are required. The commuter bus and the MARC Camden line will not operate, however. Commemorative tickets cost $25 each. Seats are limited and tickets will be sold on a first-come, first-serve basis. Penn Line service will depart from Baltimore’s Penn Station every 30 minutes from 7:30 to 11 a.m. and afternoon trains will depart from Washington’s Union Station from 1:30 to 7 p.m. Brunswick Line service will depart from Martinsburg at 7:25 and 8:25 a.m. and from Frederick at 8:15 and 9:15 a.m. Afternoon trains will depart from Washington for Martinsburg at 3:30 and 4:30 p.m. and for Frederick at 4 and 5 p.m.
Virginia Railway Express commuter train service will not be operating on Inauguration Day. The water taxi service will depart from the Alexandria City Marina at 1 Cameron Street from 6:30 a.m. to 6:45 p.m. on January 20 to Washington (southwest waterfront at Maine Avenue SW and 7th Street SW). Round-trip tickets cost $40 per person; reservations are required. The trip takes approximately 45 minutes each way. The water taxi is heated. If you are staying within 2 miles of the U.S. Capitol, walking to the swearing-in ceremony will be the most reliable method of getting to the inaugural events. Please note that you will only be able to cross the Pennsylvania Avenue parade route at designated points. On Inauguration Day, a bike parking area will be established at 16th and I streets NW with space available for hundreds of bikes. Owners will be responsible for parking and locking their own bikes and availability will be on a first-come, first-serve basis. Capital Bikeshare will establish two corrals on Inauguration Day to serve members attending the events. The corrals, which are only for Capital Bikeshare bike, will be located at 17th and K streets NW (Farragut Square), and 4th and E streets SW.
Bikeshare stations in the National Mall area will be closed on January 19 and 20. A security perimeter will be established around the U.S. Capitol and the parade route. Metro stations, bus stops, and streets within that perimeter will be closed. Street closures throughout the district will make traveling by car or taxi difficult. Bridges from Virginia crossing the Potomac River into Washington as well as major roadways from Maryland may be closed to all but bus traffic. Vehicle restricted zones will be in effect from January 19 to 21, 2017. Restrictions will be implemented on a rolling schedule, beginning at Pennsylvania Avenue NW from 2nd Street NW to 15th Street NW. All closures will be in place. Inquiries pertaining to road closures should be directed to the MPD Office of Public Information at (202) 727-4383. 14th Street Bridge to 14th Street–All traffic will be diverted by MPD onto the Southeast/Southwest freeway beginning at 5:30 a.m.
Roosevelt Bridge–Traffic coming across the Roosevelt Bridge will be diverted onto northbound Potomac River Expressway to Pennsylvania Avenue or Whitehurst Freeway/K Street. East Capitol Street–Open to all traffic; roadways near RFK Stadium are primary routes for charter tour bus operators. The following public entry points will open at 6:30 a.m. on January 20, 2017, and will remain open until the parade route can no longer accommodate additional people. Up to 1,500 private buses carrying approximately 100,000 participants are expected to arrive in Washington for the Inaugural Day events. Parking is available only at RFK Stadium. Passengers will be able to take Metrorail, walk, or, in limited cases, ride shuttle buses to the events.